Walking – and walking in tandem with your pet – is probably the easiest, most convenient, and pleasurable of all the exercise routines out there. Working and walking together, we are positive both of your fitness goals will be satisfied. There are certain commands that your pet should know prior to walking in public or visiting dog parks. 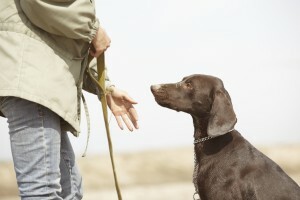 Sit, Stay, Heel, Down, and Drop It are great introductory commands that will inform your pet of certain boundaries to keep in mind along the way. Likewise, training your dog how to properly walk on a leash will go a long way towards making your time together enjoyable. You are your dog’s pack leader and, as such, your dog wants to please you by knowing, meeting, or exceeding your expectations. Professional intervention may be a preferable option for your pet if you fear aggressive or destructive behavior around other animals or strangers. For the best walking practice for your pet and others around you, your pet should be attached to a sturdy 4-6 foot flat leash. We do not recommend Flexi-lead or retractable leashes due to their potential for serious accidents like lacerations, entanglement, strangulation, and escape. Etiquette surrounding your pet’s behavior on the leash is not only worth knowing but may encourage longer walks in new areas. If you are struggling with leash training or what type of leash is right for your pet, please don’t hesitate to ask us! Walking is obviously great for people because it supports elevated mood, lower blood pressure, decreased stress, and better sleep. And the same is true for your pet. With regular walking, both of you will be warding off weight-related health problems like diabetes, cancer, or cardiovascular disease. Likewise, walking together in your community or along local trails also provides opportunities to meet others like you and this socialization bolsters self-esteem and confidence. Pets that aren’t given outdoor opportunities are more susceptible to health issues, withdrawal, and destructive behaviors. We understand that January, and February, too, for that matter, is a tough sell for outdoor motivation, but that doesn’t mean that your pet’s exercise routine gets placed on hold. Either get your pet outfitted in warm, waterproof gear or consider signing up for indoor training sessions this winter. By the time spring arrives, you and your well-behaved pet will have a great deal to show off. Enjoy your pet’s company and reward him or her with extra cuddles and kudos for working with you on training, walking, or both!